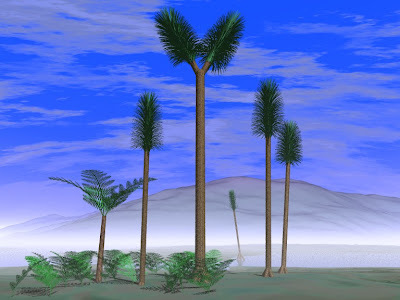 Life Before the Dinosaurs: Sigillaria. Sigillaria (sidge-ill-AIR-ee-uh) is a genus of lycopod that lived from the Carboniferous to early Permian Period. It had a forked top with a club of pine needle-like leaves on both branches. Although Sigillaria and other lycopods resembled trees, they are their own group. 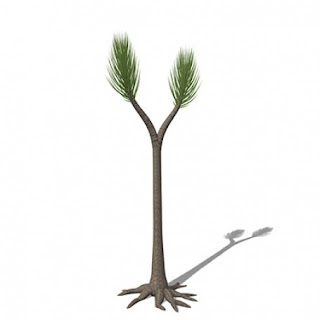 They are actually very different from true trees. Sigillaria was not made of wood and its trunk was covered in photosynthetic tissue, so its trunk may have been green. Sigillaria was very similar to Lepidosigillaria, which didn't have a forked top. Instead, it only had one club of leaves. Sigillaria had a short life cycle and only lived for a few years. Some people believe that Sigillaria may have died after reproduction, but no one has found any proof of this. Sigillaria reproduced with spores like other lycopods. It probably lived alongside other lycopods, such as Lepidodendron, and may have grown to 130 feet.